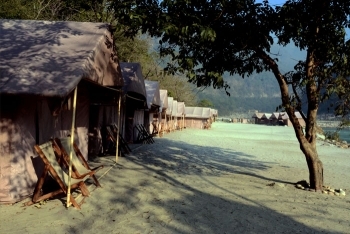 Aloha Beach Camp is beautifully located at the banks of holy river Ganga, in Rishikesh. It is a perfect destination for those who love nature and adventure. The Aloha Beach provides you with a combination of Luxury and Adventure. Guests can enjoy activities like River Rafting, Camp Fire, Trekking, Rappelling etc and play different games like Beach Volley Ball, Ball Balancing, Acid Walk, Figure of S etc. There is a vast Sal Forest, near the camp, guests may like to go for a walk in the forest and interact with local people of Rishikesh. 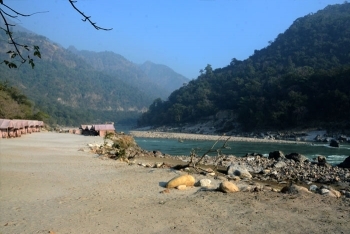 Aloha Beach Camp is located in Rishikesh, at a distance of 2 Kms from Lakshman Jhula, towards Shivpuri. There are Total 91 accommodation options categorised as : 20 Beach Tents, 29 Superior Rooms, 20 2-Bedroom Apartments (40 rooms) and 2 Suites. The Aloha in Rishikesh offers Multi-Cuisine Indoor restaurant & Multi-Cuisine outdoor restaurant next to swimming pool, In house bakery, Theme evening on request. There are 3 Multi Cuisine restaurants at the Aloha Beach Camp. Two of them are under a tent with Parachute like structure, offering beautiful view of Mighty Ganges, while the third one is a covered Dining tent. Guests can order for Indian, Chinese, Mughalai and Continental meals at the restaurant. Outdoor Experience: Wilderness- Jeep Safari at Rajaji National Park, Nature Walk, Adventure- White water rafting, Rock climbing and rappelling from a waterfall, bungee jumping, flying fox, Tarzan swing, cliff jumping, kayaking, Waterfall - Nature Trek, Paintball, picnic lunch at waterfall, Double rope bridge. - Refreshment Drink on arrival, Meals as per plan. - Morning and evening Tea/Coffee with Cookies. - Complimentary two bottles of mineral water in the room replenished daily. - Tea/coffee maker in the room. - Live flute session at evening. - Rs.1000 Spa discount coupon per person per day. - Christmas & New Year Packages will be updated soon. By Train: It is recommended to board train to Haridwar (you get plenty of trains for Haridwar), from Haridwar you can many shared auto, rickshaw, local bus and car rentals to reach Rishikesh. By Road: Buses are easily available for Rishikesh from Delhi, Punjab, Himachal Pradesh, Chandigarh etc. By Air: The best way to save time and experience a comfortable journey is to board a flight from Delhi to Jolly Grant Airport in Dehradun. From there, Rishikesh is only at a distance of 21 kms. Guests can board a bus from Jolly Grant Airport to reach Rishikesh or a taxi will also be a good option.